Soluble antibacterial for oral administration to calves in milk replacers or starter feeds for bacterial enteritis. Compatible with most milk replacers. Potent antimicrobial that provides systemic and enteric efficacy against bacteria that cause disease. Broad-spectrum oxytetracycline is readily absorbed, providing effective tissue concentrations. 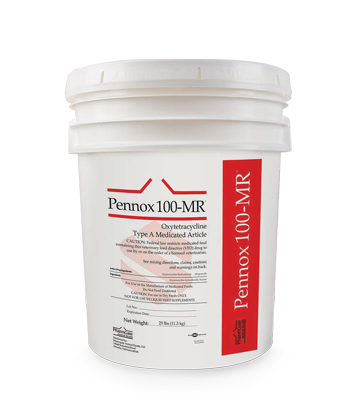 Convenient, cost-effective treatment option for calves vs injectable therapy. Free-flowing, highly soluble formulation promotes easy mixing. High-quality manufacturing at US Pharmgate facilities according to FDA requirements. For Cattle: Treatment of bacterial enteritis caused by Escherichia coli. RESIDUE WARNING: 5-DAY WITHDRAWAL PERIOD AT 10 MG/LB DOSAGE. THIS DRUG PRODUCT IS NOT APPROVED FOR USE IN FEMALE DAIRY CATTLE 20 MONTHS OF AGE OR OLDER, INCLUDING DRY DAIRY COWS. USE IN THESE CATTLE MAY CAUSE DRUG RESIDUES IN MILK AND/OR CALVES BORN TO THESE COWS. Type A Medicated Article for use in the manufacture of medicated feeds (milk replacers, starter feeds).